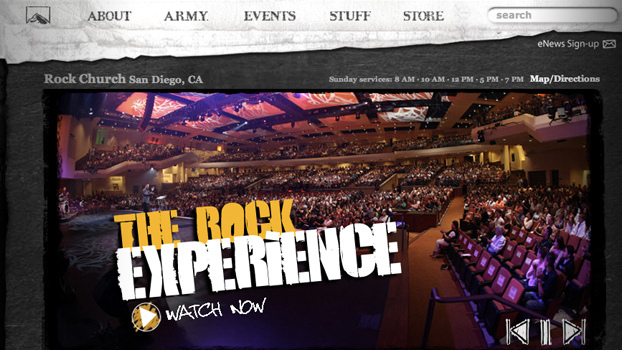 The Rock Church led by Pastor Miles McPherson is committed to sharing the gospel of Jesus Christ to all of San Diego. Miles McPherson is a man radically transformed by God. Even after fulfilling his youthful dreams of a successful collegiate football career and playing in the NFL, Miles was spiritually empty and on a path of destruction in the form of cocaine use. During his second season in the NFL, two of Miles’ teammates, Sherman Smith and Ray Preston, told him about God’s amazing love and grace. Finally, one early morning in 1984, Miles had his first encounter with the person of Jesus Christ and decided to follow Him. The moment Miles relinquished control of his life, God’s power was evident. Miles was delivered from his drug habit, experienced positive changes in his daily life and actions, and was reunited with his girlfriend, Debbie, who is now his wife. God soon set Miles’ feet on a new path: serving in ministry, learning theology, and preaching the Gospel. Miles had great dreams as a young man, but he never imagined the joy and fulfillment he would experience in sharing God’s love with others.